Are you and Orioles fan or, more generally, a baseball fan? Do you still recount the glory days of the old teams, full of your favorite players? Well, this weekend you have an opportunity to share that affinity with Mark Millikin, author of The Glory of the 1966 Orioles and Baltimore. In the meeting room of the Perry Hall branch of the library (less than 10 miles away) on Saturday, May 16th, at 2:00 pm, Millikin will recounts the story of the Baltimore Orioles and their star players in 1966. This was their first World Series champion team and had so many of the Oriole greats to play the game: Brooks Robinson, Frank Robinson, Jim Palmer, Boog Powell, Davey Johnson, Luis Aparicio, Paul Blair, and Dave McNally. Come and hear about these legendary players and the season in which they captured their first American League pennant on their way to sweeping the Dodgers in the World Series, bringing the first title back to Baltimore. This was also the season that, among many other awards, Hall of Famer Frank Robinson won baseball’s incredibly rare Triple Crown (leading the league in batting average, home runs, and runs batted in) which has only been achieved 17 times in the history of the game. Not surprisingly, he also won the American League Most Valuable Player award in the same year. Millikin will also offer sales of his book and signings (cash or check only). 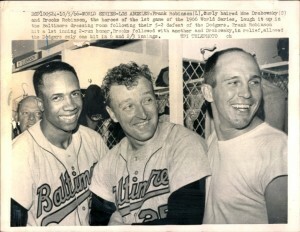 Just short of 50 years later, let’s hope the O’s are on their way to their next World Series!